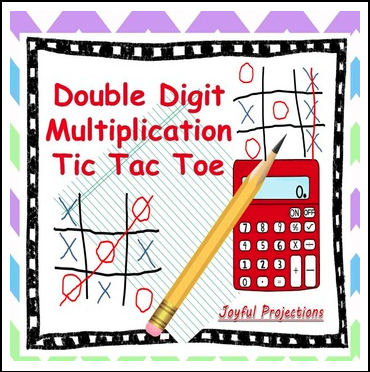 Double Digit Multiplication is one of the most difficult skills taught in my fourth grade classroom. I’ve seen lots of ‘tricks’ used to help students remember all of the steps, but basically repetition is the only way for students to master this skill. And, they hate repetition. Especially when you hand them a worksheet with 10 or more math problems that seemed so difficult during direct instruction. BUT, give them a partner, a calculator, and a couple of blank pieces of paper and those 10 repetitions will get done in no time. They’ll get immediate feedback from their partner and because no grade is taken, lots of practice with no pressure. I’ve had students teach the concept to others that were absent on initial instruction day, and others ask to play this game during recess! I love Double Digit Multiplication Tic Tac Toe day!